Home » » Police On Wild Hunt For Man Who Butchered His Mother in Ghana. Police On Wild Hunt For Man Who Butchered His Mother in Ghana. Police in Koforidua in the Eastern Region are on a manhunt for a 54-year-old man who attempted to kill his 72-year-old mother at Osubeto, a small Community near Okorase. 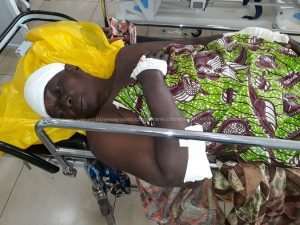 Kwadwo Adu, the 54-year-old fled after inflicting machete wounds on his mother, 72-year-old, Ofeibea Vida, in an attempt to kill her for reasons yet to be known. According to the police, the timely intervention of some neighbors heard Vida Offeibea’s cry for help, and saved her from further injuries. The Eastern Regional Police Public Relations Officer, DSP Ebenezer Tetteh, who confirmed the incident to Citi News said the police had begun investigations. “On October 31st at around 7:15, Georgina Gyampo, a farmer who resides at Osubeto Gardens near Okorase accompanied by one other person reported at the station that around 0600 hours, while at home, she heard a neighbor Vida Offeibea screaming on top of her voice for help. She revealed that upon rushing to the house of Vida Offeibea, she met Kwadwo Adu alias Kudjo age about 54 years, a known mentally ill person and son of Vida Offeiba with a cutlass in hand slashing her with it”. “She added that upon mentioning the suspect’s name, he stopped the act and absconded with the machete. Upon receipt of the complaint, Police visited the scene where a pool of blood was seen on the ground. The information we had was that the victim had been rushed to Regional Hospital Koforidua for treatment. So we followed up and found the victim Vida Offeibea aged on admission. Police observed that the victim had both the head and hands bandaged, photographs were also taken of the victim on admission for evidential purpose”. DSP Ebenezer Tetteh added that, ” The medical officer on duty Dr. Samuel Asante informed us that, the victim had deep wounds on both hands, neck and the head soaked in blood. The statement was taken from the victim whiles frantic efforts are being made to trace and arrest the suspect”. DSP Ebenezer Tetteh called on the general public to assist the police by providing information.